Alex Pietrangelo has seven goals this season, third among NHL defensemen. 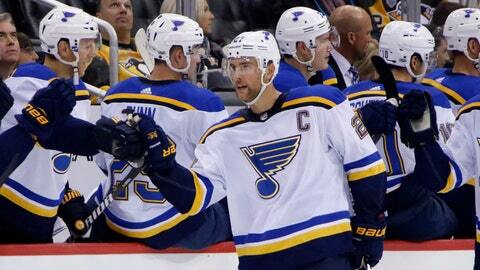 Veteran Jay Bouwmeester remains on injured reserve, but the St. Louis Blues got their top defenseman and captain back Sunday when Alex Pietrangelo was activated from IR. Pietrangelo has missed the past four games with a lower-body injury. He will be active when the Blues take on the Jets tonight in Winnipeg, one day after beating them 2-0 at home. Pietrangelo, 27, has played in 30 games this season and ranks third among NHL defensemen with seven goals and is tied for ninth with 23 points. He averages 25:45 in time on ice, the sixth-highest figure in the NHL.